As I sit down to write this initial blog entry, I can?t help but think what an exciting time this is for the Minnesota Twins organization and millions of baseball fans across the region. Think about it. Over the past 30 days, the Minnesota State Legislature passed the Twins-Hennepin County ballpark bill, ending a decade of debate and helping preserve the franchise for future generations. If the historic passage of the ballpark legislation wasn?t enough, on the field a nucleus of young, up-and-coming players has emerged, helping bring the Twins back to the .500 mark and hopefully back into contention in the American League Central. Yes, it?s a great time to be a Twins fan. The excitement of the past month is nothing compared with the anticipation for the return of outdoor baseball in April 2010. 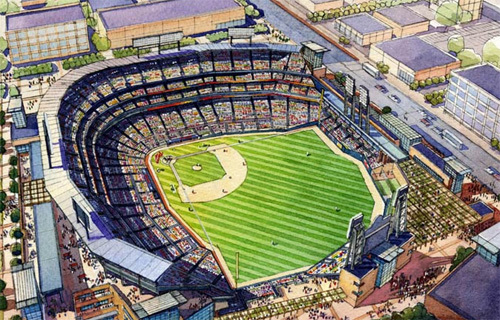 Our organization is already deeply immersed in the planning process, which will result in the construction and opening of one of America?s best baseball venues. As the Twins begin to focus on the new ballpark, fans across the Upper Midwest will be front and center. In fact, this blog is designed to take fans along -? every step of the way — from the design process to the groundbreaking to the first pitch. The next 3 1/2 years promise to be jam-packed with new ballpark developments as the facility emerges in the Minneapolis warehouse district. We intend to utilize this space to provide fans with ?insider? perspective on the latest timelines, ballpark news, ticket options and much, much more. So check back soon as the ballpark process begins to ramp up.